Today marks the first official day of Spring in the Ozarks, and our bear residents are slowly awakening from their winter sleep! While cold weather made them drowsy, we haven’t been seeing much of them on warm days because they still have their winter coats, which means they get hot easily. Large bears, like our grizzly, Bam Bam, and Russian Brown Bear, Huggy, have been hiding out from the “heat” while smaller black bears, Holli, Lolli, Xena, and Koda G., have been more tolerant of it. The creation of our new bear habitats, which officially opened in late October, has given us the exciting opportunity to see how our bear residents might behave in a more natural environment. 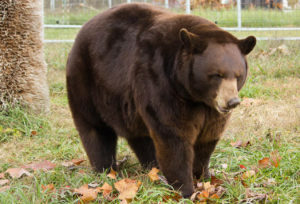 Bears born in captivity, like those mentioned above, have been in or out based on their size and coat thickness. Popper, a black bear who grew up in the wild, has been behaving a bit differently, as predicted. 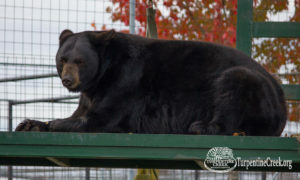 Unlike the other bears who were introduced to the new habitat, Popper quickly set to work crafting a nest for the winter, where she has spent most of her time. She has emerged on nice days to sun herself or relax in the shade but later retreated to her nest. Though her behavior almost completely mirrors that of an independent wild bear, she is not too good to occasionally accept goodies from our animal care team. As winter departs and the greenery that comes with spring returns, we are excited to observe how the bears who reside in this habitat behave, especially Popper! She has already demonstrated an ability to forage for food, and we are curious to see if her habitat mates catch on (though we will continue to provide everyone with food whether they do or not). You can visit our new bear enclosures by taking an exclusive tour. We can’t wait for you to enjoy this beautiful weather with us!